When Iwan Simonis started to become increasingly popular in the U.S. market in the early 80's, the typical color for cloth in commercial rooms in North America was a blue-green color, commonly referred to as American green or traditional green. In order to make it clear that a room was using something different, we offered our yellow-green cloth to the commercial rooms. The yellow-green cloth is brighter than the blue-green cloth and it was apparent at a glance that the tables were covered in something different. As years passed, players and room owners began to use the term "Simonis Green" to let people know what color cloth they were referring to. 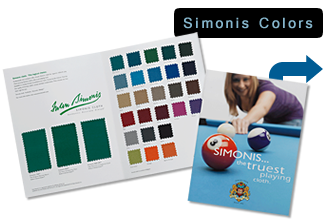 Today, Simonis Green is what we call our yellow green billiard cloth and it has also become referred to as Tournament Green because of all the tournaments that Simonis Green cloth has been used in. Available from Simonis AND Aramith. Green manufacturing is important to our world and consumers in more and more countries around the world are lookign for products that are made responsibly when it comes to our environment. It is a responsibility of leading manufacturers like Simonis and Saluc to embrace the concept of green manufacturing and strive to find ways to reduce the consumption of energy, reduce our carbon footprints and reduce waste associated with our manufacturing process. While many cloth and ball manufacturers are not concerned with the principles of green manufacturing, Iwan Simonis and Saluc are environmentally conscious manufacturers and we are also considered to be low environmental impact companies. Both Iwan Simonis S.A. and Saluc S.A. are located in Belgium which has strict standards for manufacturing and is a member of the Kyoto Protocol. Iwan Simonis S.A. and Saluc S.A. are committed to reduce energy consumption for manufacturing in order to reduce electrical consumption and carbon dioxide emissions. From utilizing state-of-the-art high-efficiency units to heat and light the manufacturing facilities, post-treating the water used in manufacturing before sending it on to the local water treatment facility, using recyclable packaging materials, and encouraging the recycling of all manufacturing waste products, we make sure our impact is properly managed. Our products are products you can be proud to use! We don't just care about the billiard world, we care about our entire world.